Discussion in 'General' started by Elven6, Feb 2, 2009. What significance did the bear hold during the war for the Germans? It must have held something to be showcased in German war photography to this extent. In the comments from the first site people (After looking past all the "their not allowed to have a sense of humor because their Nazi" comments) a few people talk about everything from the bear being the logo of the unit to it holding significance in German mythology (Something about "Santa Claus"), I even read one guy say it was for a promotion done by "Fanta" during the war in Germany. Has this WW2 talk advert anything to do with it? The Berlin Coat of Arms is a Bear and so any Divison or Unit connection with Berlin may have used a Bear to show the relationship. Oh my, I just noticed that ad as well, looks like the admin has some filtering to do! That seems plausible, it would probably explain why it was so heavily represented in these images. It's not just German units who took the bear as an emblem. At the end of the war the Royal Signals recovered a stone carved bear holding a cable drum from outside a cable manufacturing company in Berlin. Having some relation to their 'trade', this was 'procured' and 'Bruno the Bear' became the emblem of 10 Signal Regiment, standing for many years ouside the RHQ in Cavalry Bks, Hounslow, London. 10 Signal Regiment was disbanded for a few years and Bruno took its place in Vimy Bks, Catterick then Blandford before returning to 10 Signal Regiment on its reformation at Corsham, Wiltshire. Bruno the Bear with its cable drum is still part of the regimental identity 60 years after the small statue was procured from the factory in Berlin. A little off topic maybe, but interesting how the traditions of one city can become so ingrained in the traditions of a regiment of another country. It looks pretty real however it's a little unusual in that the men are only wearing one ammo pouch on their belts. I don't think I've ever noticed that before. 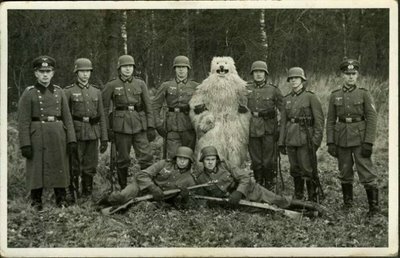 There is something strange about the picture (other than the bear outfit). I started looking at some other shots of German soldiers and did come across another with three fellows wearing only one ammo pouch. I think what is odd about this shot is the length of the rifles. Take a look at this guy. He's a bit goofy but also notice the length of his K98. If he put the but on the ground it would only come up to his belt (looks like he's also left the bolt open on his rifle). The guys in the bear picture are either really short or they have WW1 issue K98s. It looks pretty real however it's a little unusual in that the men are only wearing one ammo pouch on their belts. I don't think I've ever noticed that before. Yep they go into detail on that rumour and a few historians in the comments section of the first link have essentially debunked it. Was it the Berlin Cable Bear that passed through Blandford 30 Sigs in 1962?